Yes You Can Upgrade to a Quality RV – Even on a Budget! Lots of people are on a budget these days. Expenses crop up; like paying for a child’s college tuition, or maybe the house needs repairs. With everything costing so much today there can be little money left over for recreation, especially for a fun vacation. Hotels can be pretty costly, and inconvenient too, if you happen to come into one that is booked for the night. Perhaps you’ve dreamed of owning your own RV and just taking off when the mood strikes, and really being in command of your travels. The only thing stopping you, you figure, is the price. Surely RVs cost a lot, right? Well not if you buy one from Pedata RV Center. But wait a minute, we forgot one other scenario: What if you already own an RV, and maybe it just doesn’t meet your needs anymore…to get the one you want, you’d have to sell yours first…Don’t worry! Pedata takes trades, so don’t let that stop you. Feel free to call us at 888-545-8314 about your current RV, and we’ll talk trade-in value. The first thought that likely comes to your mind is, why would I buy from an RV center in Arizona, when I could just buy an RV here in my own city? The answer is simple: Our buyers hand select RVs from across the country; we only choose the very best RVs for our inventory. 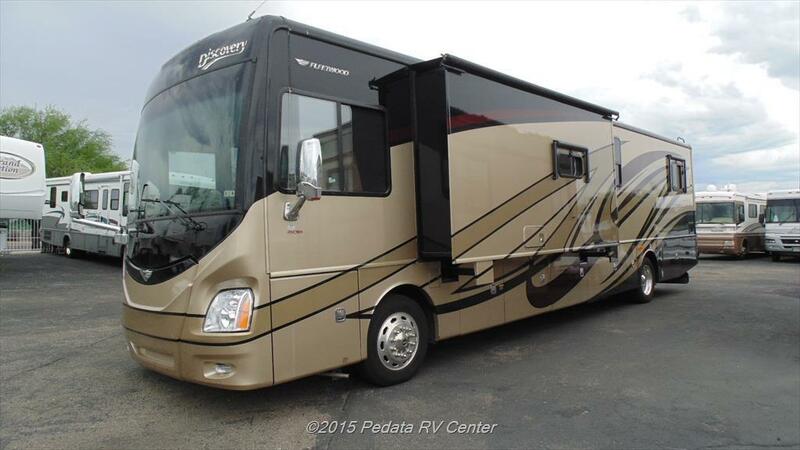 Still the matter of price may make you pause…you think you just can’t afford a new RV! Subscribe now to our newsletter. When you do, you will receive it direct to your inbox, complete with ‘Newsletter Special’ pricing on a variety of superb used RVs. Just visit our home page and on the left hand side of the page, beneath our logo, you will see a sign up box that says: Receive Special RV Offers! That’s it! Sign up today and let the special offers come straight to you. Each used RV is different, and not all will feature the above amenities, but these are the types of quality features you can look forward to when you purchase a used RV from Pedata RV Center. Don’t forget to ask us about financing, which can make your RV purchase even more affordable. As an additional incentive, we will pay up to $500 towards your airfare so you can come out to our Tucson showroom and see our used RVs. Doing so can keep you from making what we call the ‘$10,000 mistake’ — that’s when someone dramatically overpays for an RV. That won’t happen when you shop at Pedata RV Center! Buy a Quality Used RV from Pedata – We Make It Affordable! So we hope we’ve helped you discover that yes, even on a budget, you can afford a quality RV. That vacation you want to take is now possible — why not start planning now? Take the first step today and give us a call: 888-545-8314. There’s a great used RV with your name on it at Pedata RV Center!